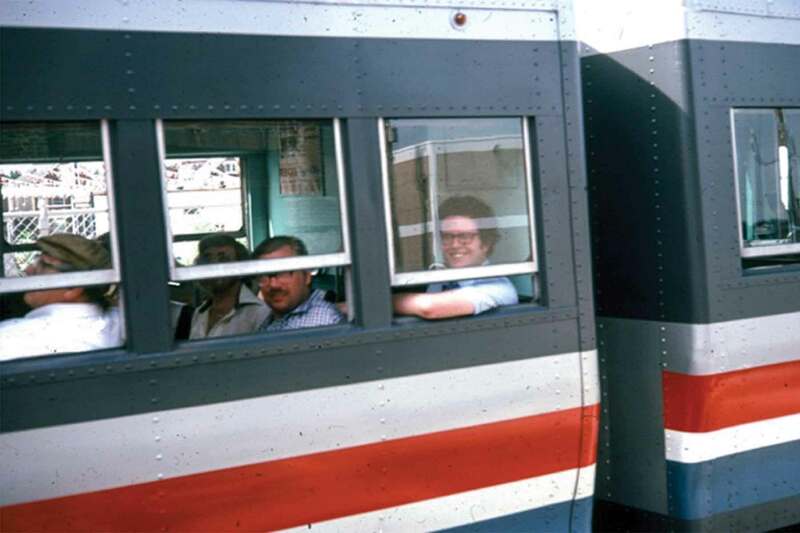 Charlie Akins (elbow out) riding a rapid transit car in Chicago during the 1970s. 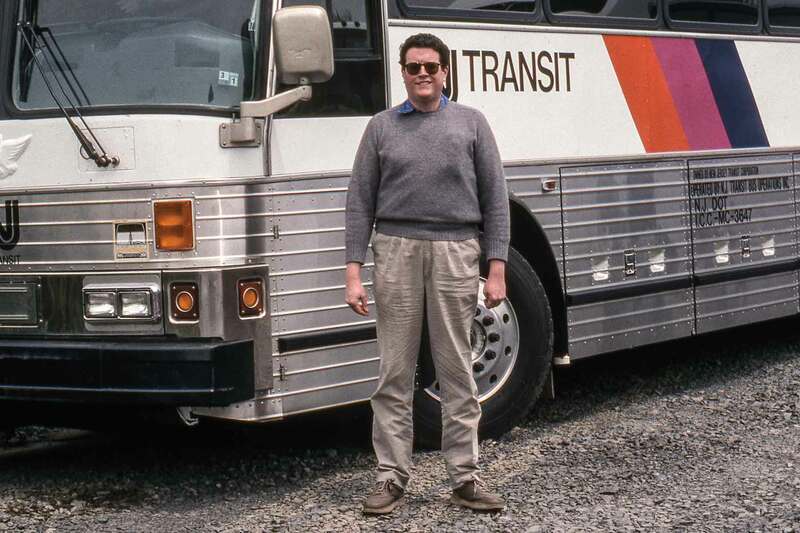 Charlie in 1990 posing in front another mode of mass transit that he advocated. Charlie and Harold H. Geissenheimer, a former ERA president who died in 2010. Charles A. Akins passed away on March 22, 2006 after a long battle with cancer. His service to the ERA and the NY Division was lengthy and distinguished. Charlie will be remembered in the years ahead as a leading light of our organization, full of ideas to improve the way we operated. 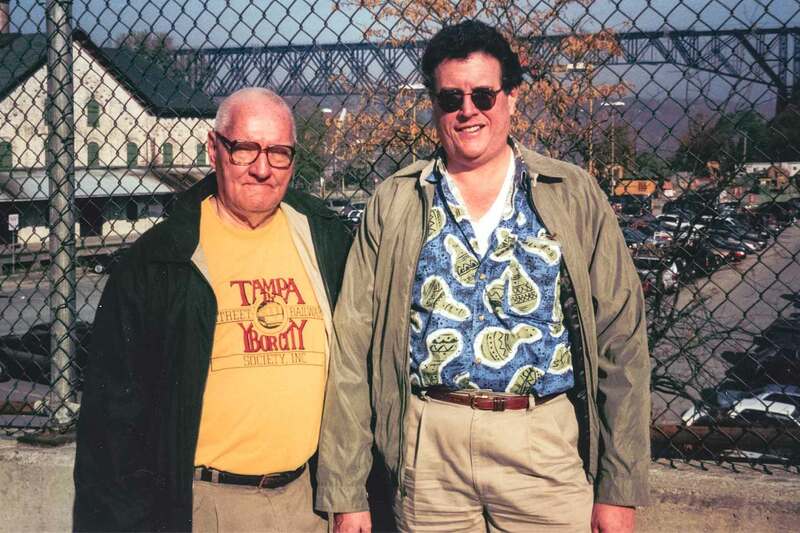 Charlie first joined the ERA in 1964 and held a variety of offices in both the NY Division and the national ERA for more than 30 years, including two long periods as NY Division chairman in the 1970s and 1990s. He continued as first vice president of the national ERA and held that office until his death. Many considered his the connecting link between the great founders of this organization in the years before World War II and the ERA we know today. Charlie was born in Brooklyn, grew up in its rich streetcar and rapid transit environment, and as a result developed a lifelong interest in electric railways. A graduate of St. Francis College in Brooklyn, he first worked as a teacher in the New York City public school system. He then went on to a distinguished 35-year career with the Social Security Administration, receiving many honorary and performance awards. Charlie had a great love for New York City, frequently attending the theater and New York Philharmonic performances. He closely followed politics and current events, and could never finish reading each day’s New York Times. He was a member and contributor to St. Joseph’s Church and contributed generously and frequently to other worthy causes. He was known as an experienced international traveler and was fortunate enough to see many overseas destinations. Finally, he was the type of person who developed friendships with both work and hobby colleagues and kept them for decades. No words in the English language can adequately describe the sense of loss we have for our close colleague, our intrepid traveler, our fellow railfan, and our dear friend. His presence will be sorely missed, his brilliant thinking will not be shared and his voice unheard, but we will cherish his memory in our hearts for the rest of our lives. All of us earnestly pray that God rests his soul.